Office 365's People app is your Outlook address book, Stonehill directory, and one of the most powerful and user-friendly ways to get detailed contact info for Stonehill faculty and staff all rolled into one. 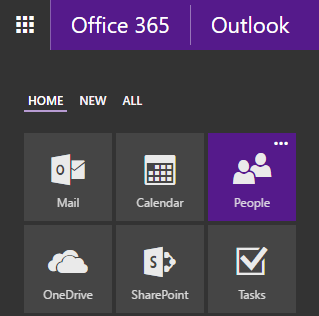 You can access the People app from anywhere in the Office 365 web environment by using the App Launcher and clicking People. There you'll see frequent contacts (with profile picture if they've added one), scheduled meetings, directory searches and more. Beyond using it directly, the People app also powers a number of convenient features in Outlook, Skype for Business, and anywhere else contacts appear in Office. For example, right-click someone in Skype for Business and choose "See Contact Card", and you'll see detailed contact info such as their Stonehill email address, business phone, department, office location, or any other information included in . We've only scratched the surface of the networking and collaborative capabilities of the People App's many integrations in Office 365, so to learn more head over to Microsoft's resources on the People App and start exploring. If you have any questions or need assistance, check out our Office 365 ProPlus FAQs and/or contact the IT Service Desk at 508-565-4357 (HELP) or email service-desk@stonehill.edu.